The Central Florida Media pool coordinated pool coverage of the OneOrlando Fund Town Hall Meeting on Thursday August 4th. Mr. Feinberg is expected to speak to the media after the 12:30 PM Town Hall meeting in the media room. He will be arriving close to the start of the 12:30 meeting. He may have time for one on one interviews after his initial group session with the media. Everyone will be screened when entering and re-screen upon re-entry into the Amway at the VIP entrance at Church and Division beginning at 9AM. Please be aware you could be delayed upon re-entry when the crowd and media volume is high. The live truck parking is at the Northwest corner of Division and Church. The distribution equipment will be placed in the live truck parking area at Church and Division at 9 AM. The distribution equipment was placed and tested in the media room Wednesday. Anyone planning to record the feeds should bring cables approx. 30 feet in length. The tables where the media can sit comfortably and plug into power and record are approx. 25 feet away from distribution equipment in the media room. You can use shorter cables but you and your recording equipment will likely be on the floor. Bring plenty of cables, adapters and jumpers, some stations ran short today. Arrangements have been made for a studio camera operator to man the pool television camera supplied by the Orlando Magic from 11:30 AM to the conclusion of the event Thursday night. The operator is familiar with the camera used for sporting events and concerts in the Amway. The camera and infrastructure feeding the pool is native 720p which why the feed is 720p. A translator will seated in the town hall meeting and will be be doing a simultaneous translation from English to Spanish to feed wireless headsets for people in the crowd and the media feeds. The pool will be providing a Spanish video and audio feeds in the media room only. 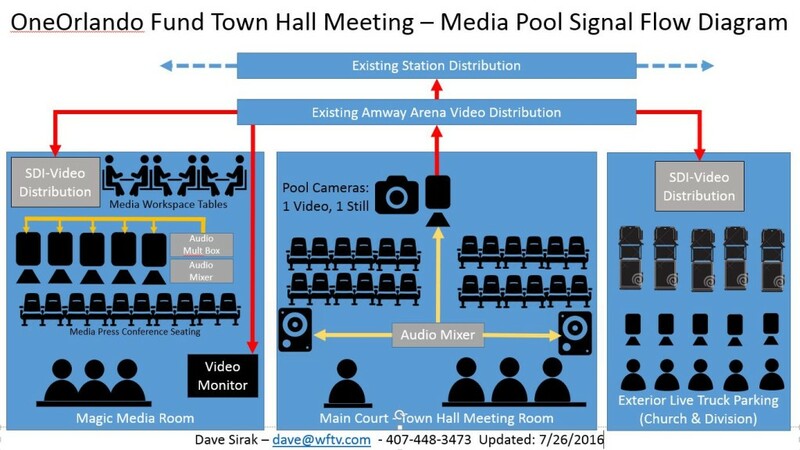 The City of Orlando will be streaming the town hall meetings. The player will allow users to select either Spanish or English. There will be a seating section set aside for people who wish to speak but not be photographed. All other participants will be photographed when they speak from the seats using a passed wireless microphone. Event organizers will inform people wishing to speak to media to come to the media room. I would expect some comments may be press conference style and some may be individual or group interview in the media room. Any registered members of the media interested in assisting and inspecting and testing the technical setup are invited to the Amway at 1 PM on Wednesday. Please meet at the group at the Admin entrance so security can check everyone in at 1 PM. The media may enter and setup in the media room at 9 AM on Thursday. Media will be able to access the Orlando Magic’s wifi, password TBA. Mr. Feinberg is expected to speak for 45 minutes for each session. After he is done he will take questions and comments from audience. It unlikely the town hall meeting will run head to head with any newscasts in the market. The length of Town Hall meetings will depend on the number of people wishing to speak publicly. While stations may take a feed in their live truck stations are encouraged to bring a recording device into the press room. Press should be prepared to cover a press conference with Mr. Feinberg and other speakers at the town hall meetings that may wish to speak to press in the media room. Based upon responses here are the planned feeds in the media room: HD-SDI English (BNC 720p), HD-SDI Spanish (BNC 720p), SD-SDI (BNC 480p), Analog Video (BNC NTSC), Analog Audio (Live Level – XLR). We will bring extra adapters and converters to adjust as needed. Stations may park and establish live shot locations at the corner of Church and Division on August 4th. Division street will be closed to traffic at 6 AM on August 4th. Stations may park in open metered parking spots prior to the street closure. The pool feed will be produced by the local stations and will be made available to all verified media at no cost and will be released to the public domain upon completion. All verified media approved for access by the City of Orlando should wear media identification must bring and provide their own equipment to record or capture the live pool feed. While the material is public domain no DVDs, USB drives or FTP sites will be made available by the City of Orlando or the Central Florida Media Committee other than a website for distribution of still photos to verified media outlets. One pool video and one pool still camera are permitted in the room where public comments are heard. 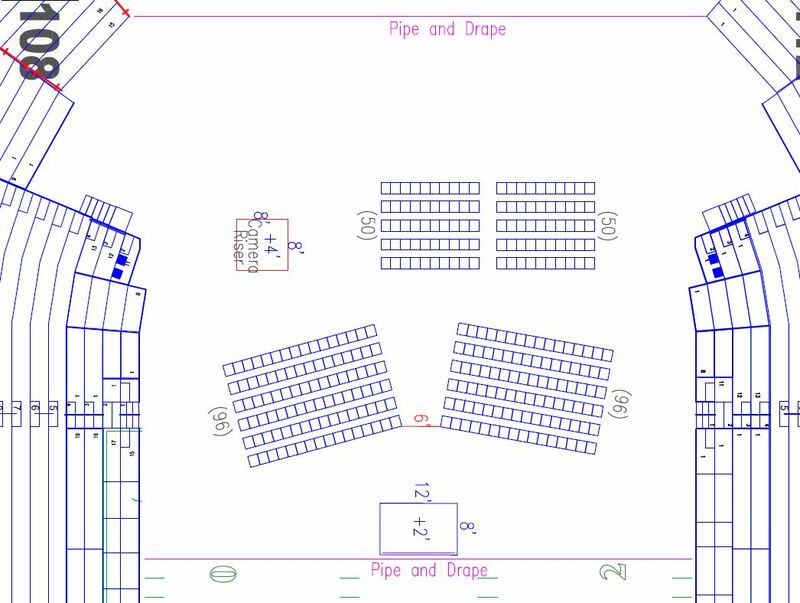 A feed from the video camera would go to a media room (magic press room) where media may watch and record the feed. Still photos will distributed to approved media via a website such as Flickr or Dropbox. Media may watch and listen in the main room in which the public comments are made but no persons will be able to use cell phone cameras. Media may use phone, tablets and laptops for note taking but not photography. The Magic media room and press conference setup will host press availability with Mr. Feinberg, Mayor Dyer and any other officials related to the event. Should people making public comment wish to address the media may visit the media room and take questions before or after their statement from the press conference setup. The setup in the media room will not be pooled and stations should setup their own cameras and recording devices in the media room. All of the stations may use the existing installed cables and transmission equipment installed in the Amway for live broadcast during Magic games.